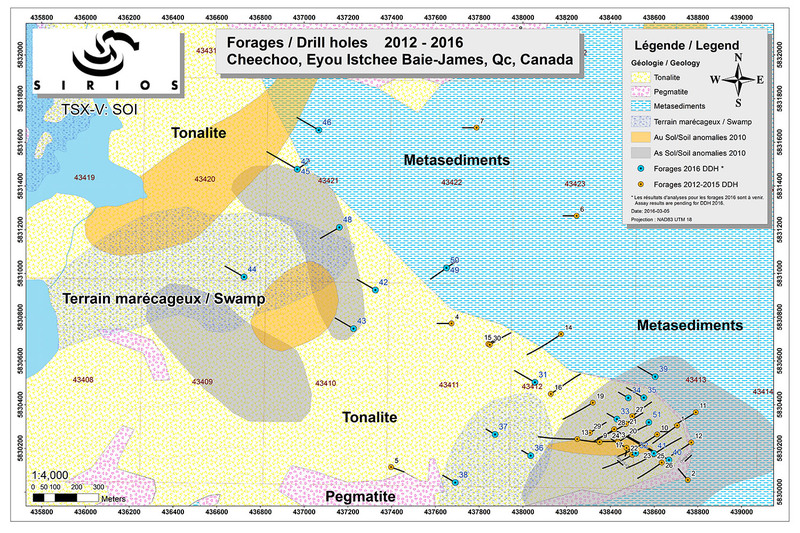 Confirmation of Gold Grade of New Lithology with Visible Gold Observed in Three Drillholes Outside the Known Gold Zone, Cheechoo Gold Project, Opinaca Area, James Bay, Québec - Golden Valley Mines Ltd.
“As announced in the February 9 2016 news release, drillhole #40 intersected a biotite schist unit over 36 metres (true width unknown). The section with visible gold yielded 2.12 g/t Au over 11.5 metres between 315.5 to 327.0 metres, including 3.05 g/t Au over 6.4 metres with a highest grade value of 6.13 g/t Au over 1.2 metres. A section containing all the biotite schist unit, yielded 1.27 g/t Au over 39 metres between 295 to 334 metres. In addition, a sample of 2.88 g/t Au over 3.2 metres was obtained between 346.9 to 350.1 metres. Presently, assays results are only available for the last section of drillhole #40 between 287 to 355.4 metres, overall this section yielded a grade of 1.0 g/t Au over 68.4 metres. Nine drillholes (#42 to 50) were completed in an area between 0.5 to 1.5 kilometres northwest of the known gold halo delineated 1.1 kilometres to the northwest by drillholes #15 to 30. Visible gold was observed in three drillholes (#42, 47 and 48) proximal to the geological contact between tonalite and meta-sedimentary rocks. The presence of visible gold is now confirmed at more than 1 kilometre northwest of the known gold halo. In drillholes #47 and #48, new mineralogical assemblages were observed in meta-sedimentary rocks and in tonalite, which are marked by geological alteration of diopside, garnet, brown tourmaline, chlorite and black quartz-tourmaline veinlets. Mr. Dominique Doucet, P. Eng., President of Sirios, is the Qualified Person pursuant to National Instrument 43-101, who has prepared and reviewed this news release and is responsible for the technical information reported herein, including verification of the data disclosed, the sampling, and the analytical and QA-QC data underlying the technical information. Sirios must make a payment to Golden Valley of $500,000 (cash or equivalent in SOI shares) prior to June 13, 2016 (notwithstanding the foregoing, Sirios shall have the obligation to pay in cash that portion of the $500,000 which would result in Golden Valley becoming an insider of Sirios). If the price of Gold is less than $1,200 per ounce, a 2.5% royalty on the Gold Portion shall be payable to Golden Valley. The Company typically tests initial grassroots targets while owning a 100% interest therein and then seeks partners to continue exploration funding. This allows the Company to carry on its generative programs and systematic exploration efforts at other majority-owned grassroots projects. The Company (together with its various subsidiaries) holds property interests in projects in Canada (Saskatchewan, Ontario and Québec). This news release contains certain statements that may be deemed “forward-looking statements. Forward looking statements are statements that are not historical facts and are generally, but not always, identified by the words “expects”, “plans”, “anticipates”, “believes”, “intends”, “estimates”, “projects”, “potential” and similar expressions, or that events or conditions “will”, “would”, “may”, “could” or “should” occur. Although the Company believes the expectations expressed in such forward-looking statements are based on reasonable assumptions, such statements are not guarantees of future performance and actual results or realities may differ materially from those in forward looking statements. Forward looking statements are based on the beliefs, estimates and opinions of the Company’s management on the date the statements are made. Except as required by law, the Company undertakes no obligation to update these forward-looking statements in the event that management’s beliefs, estimates or opinions, or other factors, should change.